High red blood cell count sometimes occurs briefly in response to fear. You've doubtless heard of anemia, when the body doesn't have enough red blood cells. The opposite situation, too many red blood cells, is called polycythemia. It's a fairly rare disease symptom, and your kitty's veterinarian will have to do some tests to determine the cause and treatment. Polycythemia thickens your cat's blood, making it hard for it to move through his system while depriving cells of necessary nutrients. Under normal conditions, red blood cells carry oxygen, while the white blood cells fight off infections. Red blood cells should make up between 35 and 55 percent of your cat's blood volume, but if he's suffering from polycythemia, the count may increase to 65 to 75 percent. There are three main types of polycythemia: relative, transient, and absolute. The transient type can happen very quickly when the cat's spleen contracts in response to fear, anger or extreme stress, sending red blood cells into his system. This form of high RBC will vanish on its own. If your cat becomes dehydrated, he might experience relative polycythemia because plasma volume is decreased relative to the volume of red blood cells. If that happens, your kitty will require intravenous fluids for rehydration. Once plasma volume is normal, the red blood cell count will return to normal. Absolute polycythemia occurs when there's an overall increase in red blood cell production by your cat's bone marrow. Primary absolute polycythemia is the direct result of increased bone marrow production, while secondary absolute polycythemia is caused by an overproduction of erythropoietin, a hormone that stimulates red blood cell production. In these cases, cause and treatment must be determined. It usually takes a while for Fluffy's red blood cell count to rise in a case of absolute polycythemia, so early signs may be subtle. Your kitty may not have as much energy as he once did, and he won't play as much. As the condition progresses, he might have nosebleeds and sneeze frequently, and his gums may take on a blue hue. His abdomen may swell. In time, he will become quite ill if the disease is not treated. He may vomit, have diarrhea, and stop drinking. He may have seizures. Other symptoms depend on what type of polycythemia is affecting him, and the underlying cause. If your kitty's red blood cell count is elevated, your vet will do some diagnostic testing to discover the cause. Tests may include a urinalysis, complete blood count and blood oxygen levels. Fluffy's high red blood cell count could be caused by a kidney tumor, bone marrow cancer or cardiac or lung problems. If nothing appears to be amiss with your cat's organs or overall health, the diagnosis will be polycythemia vera. That means it's "true" polycythemia, with no identifiable underlying cause. If the diagnosis is polycythemia vera, your cat will be hospitalized to have red blood cells removed via bloodletting by opening a vein. A specific amount of your kitty's blood might be removed over a period of several days. If his oxygen levels are low, Fluffy will require oxygen therapy. Your vet may also prescribe a medication to slow production of red blood cells. Fluffy might have to stay on this medication for the rest of his life, with regular monitoring by your vet. But depending on his progress, he eventually could be weaned off the drug, which can have side effects such as appetite loss, vomiting and diarrhea. What Is Vitamin B12 Used for in Cats? 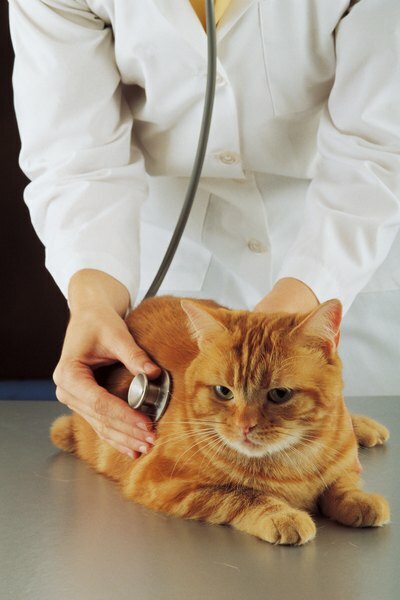 Do Healthy Cats Need Blood Work Once a Year? What Is a Good Tank Mate for a Female Red Devil?